Right after the iSYU Karon interview I along with Vic and Crizel we headed to Provincial Capitol to witness the 4th day of Salo Tabo sa Kapitolyo. Thanks to Macky by the way for the ride to Provincial Capitol. When we arrived the place was already full of eager buyers of cheap affordable agricultural products from different municipalities. 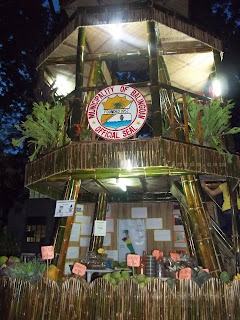 The booth of different municipalities in Misamis Oriental also was very awesome! Each represents unique artistic designed. Each also showcase there "One Town, One Product" (OTOP) aside from crops like vegetables, fruits, plants and fishes. That was actually my very first time to visit the Salo Tabo, so everything really amazed me.